We are delighted to announce our collaboration with Natalie Zfat, writer and entrepreneur. Natalie will be providing live coverage via our social media channels at the 11th Annual Visionary Awards dinner. She will be taking over our Twitter, Instagram and Facebook pages tomorrow, October 26th at 6 p.m. 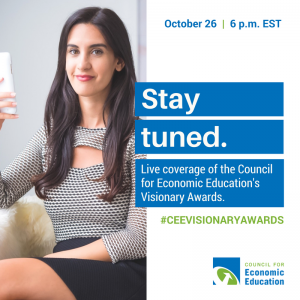 Follow along as Natalie shares her experience at the Visionary Awards–where we will honor four leaders who promote economic and financial literacy to create a better-informed society. This year’s honorees include Arianna Huffington, Founder of The Huffington Post and Founder and CEO of Thrive Global; Richard Edelman, President and CEO of Edelman, the leading communications marketing firm, with 65 offices and 5,500 employees worldwide; Frank Bisignano, Chief Executive Officer and Chairman of the Board of First Data Corporation; and Glenn Hubbard Dean and Russell L. Carson Professor of Finance and Economics at Columbia Business School. Also, we will award the winners of the 4th annual Alfred P. Sloan Foundation Teaching Champion Awards, honoring three outstanding NYC metropolitan area teachers for excellence in economic education: Theresa Fisher, Ridgefield High School, Ridgefield, CT; Jonathan Joseph, White Plains High School, White Plains, NY; and Gloria Schneider, SAR High School, Bronx, NY. Thank you, Natalie for your continued support of our mission and spreading word about the importance of personal finance and economic education. 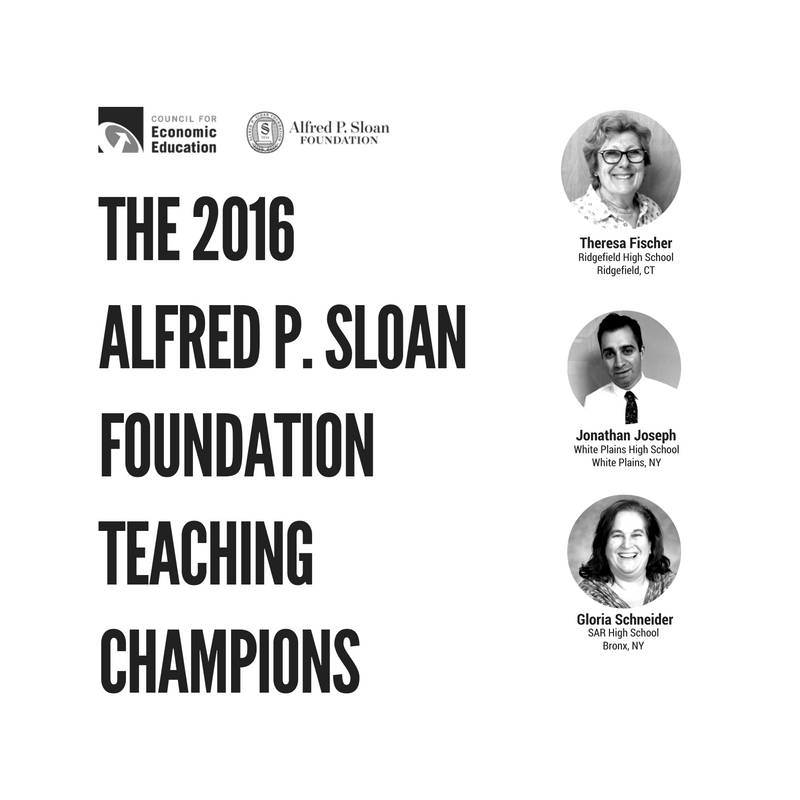 We’re thrilled to announce the winners of the 4th annual Alfred P. Sloan Foundation Teaching Champion Awards, honoring three outstanding NYC metropolitan area teachers for excellence in economic education. Demonstrating innovative teaching methods, lesson plans and learning strategies, these teachers are raising the bar for economic education, and will receive the Sloan Award at our annual Visionary Awards gala at the Plaza Hotel in New York City on Wednesday, October 26. Selected by an expert panel of judges, this year’s winners stood out for their creativity and ability to effectively engage students. This year’s winning teachers are: Theresa Fisher, Ridgefield High School, Ridgefield, CT; Jonathan Joseph, White Plains High School, White Plains, NY; and Gloria Schneider, SAR High School, Bronx, NY. The winners will co-facilitate a training workshop for area teachers and share their best lessons with teachers nationwide through videos on Council for Economic Education’s teacher website, EconEdLink. Winners receive a $5,000 prize, and their schools receive a cash award of $2,500 to support economic and financial education. Offered since 2013, the Alfred P. Sloan Teaching Champion Awards promote economic education at the high school level by recognizing and honoring teachers who effectively deliver this important content in and out of their classrooms and achieve results. The three award recipients provide students with an understanding of economics and the tools to make informed and responsible decisions throughout their lives. Congratulations to these three outstanding teachers! The Council for Economic Education is delighted to announce the winners of the 2016 John Morton Excellence in Teaching of Economics Award, honoring three outstanding teachers for excellence in economic education. Demonstrating teaching concepts that improve and stimulate economic understanding in and out of their classroom, these teachers are raising the bar for K-12 economic education, and will receive the John Morton Award at CEE’s 55th Annual Financial Literacy and Economic Education Conference on October 7 in Phoenix, Arizona. Selected by an expert panel of judges, this year’s winners stood out for their innovative approaches and classroom results on an important subject. They also encouraged their students to use economics and financial literacy as a means to acquire the skills necessary to succeed in their education and their future careers. This year’s winning teachers are: Gina Boyd, Mayflower Mill Elementary School, Lafayette, Indiana; Patricia Dennis, Sonara Middle School, Springdale, Arkansas; and Jacob Clifford, San Pasqual High School, Escondido, California. “These three teachers exemplify outstanding and innovative economic teaching approaches for all ages. 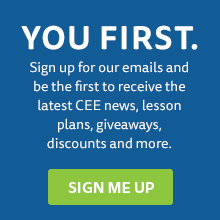 They bring economics to life for their students and have clearly shown their commitment to economic education that extends beyond the classroom,” said Nan J. Morrison, CEE President and CEO. 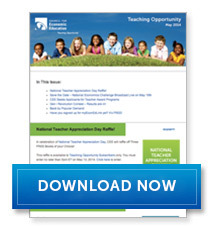 “We hope that by highlighting their achievements and passion for the subject, these educators will continue to help move the needle forward to bring economics into all classrooms. The Council for Economic Education hosted its 9th Annual Visionary Awards dinner last October. The dinner is an annual celebration honoring leaders who promote economic and financial literacy to create a better-informed society. David Wessel, Director of The Hutchins Center on Fiscal and Monetary Policy at The Brookings Institution and Contributing Correspondent to The Wall Street Journal. Master of Ceremonies Steve Liesman, CNBC Senior Economics Reporter, led the night’s Fireside Chat covering such topics as the United States’ road to recovery, the broader role banks will have in the economy, and the public perception of President Obama’s handling of the economy.